You get value and hassle-free support that only a professional travel expert can offer. You get destination & resort expertise, all-in-one package deals, exclusive specials and promotions. You will be informed about local favorites and excursions. Every trip should bring a lifetime of great memories and we strive to make it so! We talk with you, find out what your ideal vacation would be, then give you recommendations based on what matches your budget and dreams. You save more and get a better value with a professional travel expert, and your travel expert is your advocate and puts your interests first. You have us there, before, during, and after your trip. You will be provided free RFID Passport and Credit Credit sleeves to protect your identy, and that bonus peace of mind comes at no extra charge. 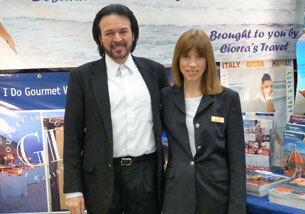 Ciorras Travel's office is open from 9am to 7pm on Monday through Friday and from 10am to 5pm on Saturdays. Other hours are available by appointment. Wondering how you can afford your perfect honeymoon or destination wedding? Our honeymoon registry comes to the rescue! Brides statistically receive 34% more when guests use their credit card for online purchases. Call us for more details or register online!